The tenancy agreement specifies a period within which the tenant would hold the right to possession of your property. However, the tenancy agreement also outlines a set of regulations that the tenant must follow. In case the tenant does not follow those regulations, these become the reason or grounds upon which the landlord remains well within his/her right to start eviction process against the tenant even though the tenancy period may not have elapsed. If a tenant has been annoying you greatly and you want to evict the tenant, it’s necessary that you don’t confront the tenant directly but fall back to the tenancy agreement and find a clause that the tenant is violating. The appropriate notice can then be served and you can then evict the tenant based on that particular violation as the grounds for their eviction. Here are some of the most common violations made by annoying tenants and you can serve them the appropriate notices to begin the eviction procedure for any of these reasons. A lot of landlords think that the tenant can’t be taken to task for paying the rent a day or two after the due date. This is entirely untrue. If a tenant usually submits the rent late, you are well within your right to serve the tenant a five day notice to either pay the rent or to quit the house. If the tenant still doesn’t pay up after the notice period elapses, you can proceed with the eviction on these grounds. In a case where the tenant pays up on time but continues to violate various regulations set out in the tenancy agreement, you can serve the tenant a notice to either cure the problem or leave the house. For instance, if it is mentioned in the tenancy agreement that no guests would be allowed to stay for more than a week and if they do so then they must add their name to the lease and the tenant still keeps the guest for longer than a week and denies you the chance to add the name to the lease, you can serve the tenant a notice to cure the problem. Similarly, in case the tenancy agreement states that no pets would be allowed inside the house and the tenant brings any sort of pet inside, you can serve the tenant a notice. If the notice is ignored, you can start this then becomes the grounds for eviction. 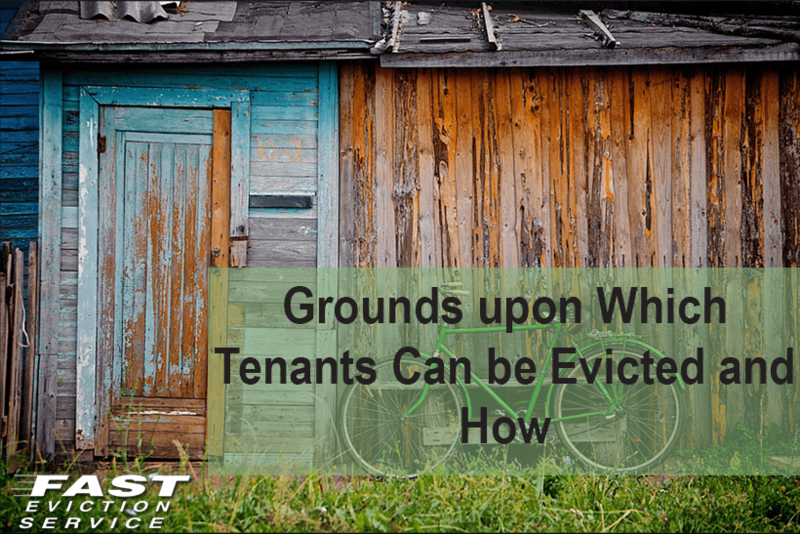 This is one reason why it is recommended to have a detailed set of regulations in the tenancy agreement so that in case you get stuck with a poor tenant, you can get the tenant evicted using violation of any regulation as grounds for the eviction. Late Rent Fees In California: How Much Can Landlords Charge?